Don't miss Seattle's first ever animal art show! Not art about animals, but art by animals. You'll find more than 20 pieces on display and for sale Feb. 7 - March 5 at Art/Not Terminal Gallery (2045 Westlake Ave). From framed animal footprints, to colorful orangutan and elephant originals, this gallery presentation is unlike any art show you've ever seen. Join us for a wine & cheese reception (provided by PengWine) on opening night Feb. 7, 7-10 p.m. Meet the keepers who will discuss the animals' art--their favorite techniques and independent styles--and the big idea behind it all: ongoing enrichment to engage and stimulate the animals in the zoo's care. Proceeds from the art show will help fund the combined conferences of the American Association of Zoo Keepers and International Congress of Zookeepers (AAZK/ICZ) being hosted by Woodland Park Zoo and the Puget Sound Chapter of AAZK in September 2009. Photo: Elephant Watoto makes a masterpiece. Photo by Ryan Hawk. The national bird of Nepal has now made its way to Seattle. New to the zoo is a pair of Himalayan monal (Lophophorus impeyanus) pheasants, donated by a private aviculturist from Burien. This species is endangered due to habitat destruction and overhunting for food. 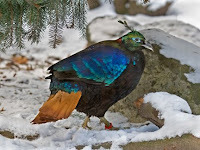 Himalayan monals are typically found at elevations 9,000 to 14,500 feet from east Afghanistan eastwards through the Himalayas to Bhutan and northeast India and northward to Tibet. During the non-winter seasons, they prefer steep, rocky terrain with occasional grassy and scrub openings interspersed with woods. In the winter months, the birds descend to forested areas at lower altitudes where there is dense undergrowth. These birds are on exhibit at the Conservation Aviary in the Temperate Forest biome of the zoo. The very colorful male is adorned with iridescent plumage that shows best on sunny days. Ironically with this rainbow of colors, what is most prominent during courtship display is the exposed white rump patch of feathers. The brown female is better camouflaged for safely incubating eggs. We bred this species in the 1980s. The keepers at the Conservation Aviary are happy once again to exhibit this crown jewel of the pheasant world. Stop by and take in all his colors! Grizzly bear brothers Keema and Denali celebrated their 15th birthday this week with some thoughtful cards and treats from their keepers! You can catch the brothers in the zoo’s award-winning Northern Trail exhibit, or watch them at home on the Bear Cam. Volunteer photographer Dennis Dow snapped some terrific photos of the gazelles pronking and the zebras in action out in the zoo's award-winning African Savanna this past week. "I was walking past the African Savanna on Friday Jan. 2 in the late afternoon and noticed that the gazelles were playing and running after each other. 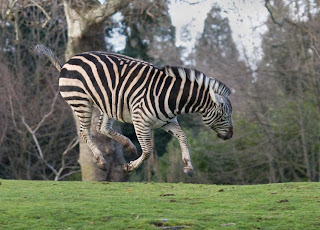 Within a minute or so the oryx and zebras followed suit and were kicking up their heels and bounding around the savanna," said Dennis. What a fun start to the new year!